Tash on the Hill: Bread, Hummus and Lamb, Oh My! Just off the House side of the US Capitol in Southeast DC lies Barracks Row – a neighborhood stretch of restaurants and bars, far enough from the Hill to keep tour groups, lobbying fly-in, and most day-to-day lobbyists away is constantly changing. These are all good things. One of the newest gems on the Row is Tash. Not to be confused with places like Cava that are traditionally Greek-inspired; Tash is much more Persian/Iranian in style – oh, and it’s tasty. Tash, which means “flame” in Persian is very fitting, as many things from the menu come is very close contact with said flames. Offering hummus, traditional kabobs, baba ghanouj, lamb kubideh, and more, Tash provides affordable food a bit different than other offerings on the popular SE corridor. Go on a sunny weekend and sit by the large floor to ceiling glass windows that open, or head over after your 4:00pm meeting in Cannon House Building that you know you shouldn’t have scheduled so late in the afternoon, and start with their house made hummus. 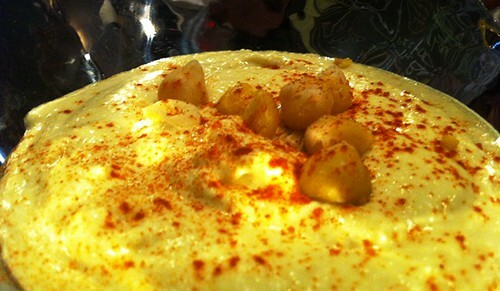 Served in a large metal bowl, the hummus is rich in flavor and smooth in texture. Seasoned delicately (could have used a bit more salt in my opinion), the large bowl of hot, fresh bread served alongside vanishes quickly as it’s necessary to inhale it while piping hot. Don’t worry, they’ll bring you some more. 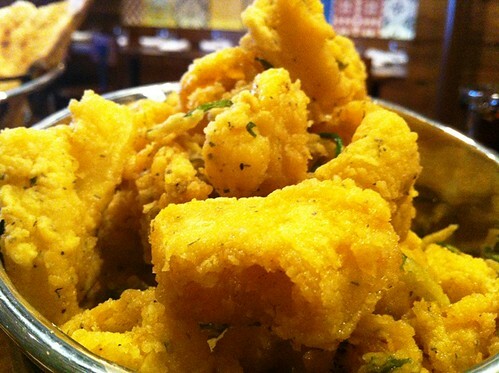 Also good is the calamari. Large rings of very tender, fried squid parts arrive in a very tall bowl, which is deceiving as there’s a false bottom about halfway up. 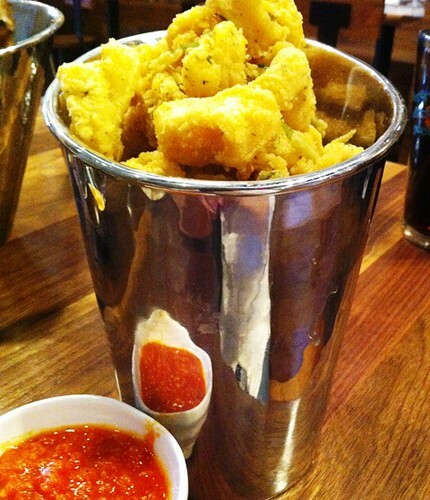 I must confess I was very exited at the thought of a 32oz Super Gulp full of fried seafood. The breading was crunchy, again, needed salt, but the smoky marinara-inspired dipping sauce was amazing. I’d eat that on a flip-flop it was so good. Lamb, obviously, is what one should gravitate toward. The marinated pieces of lamb were grilled to a medium-rare perfection, and seasoned perfectly. The rice, while a bit too much given the portion of lamb, was good. Nothing special going on there however. But the lamb and the yogurt sauce accompanying it were great. So check out Tash the next time you’re in the mood for hummus, lamb, and cocktails. That’s about daily right? Hey DC, what are you listening to?